Fiona was part of the last group of bunnies cared for at the ASPCA before being transported to Second Chance Animal Shelter in E. Brookfield, Massachusetts for adoption. While New York City braced for a blizzard on a cold January night in 2015, dozens of rabbits clung to life in a barren lot behind a Brooklyn tire shop. Some were locked in cages and hutches; others burrowed under the cold ground, desperately seeking shelter. As temperatures dropped below freezing, NYPD officers, along with staff from the ASPCA and Animal Care Centers of NYC, removed 76 rabbits from the property at Third Avenue near Ninth Street. But it wouldn’t be the last time authorities would be called to rescue bunnies from this Gowanus address. 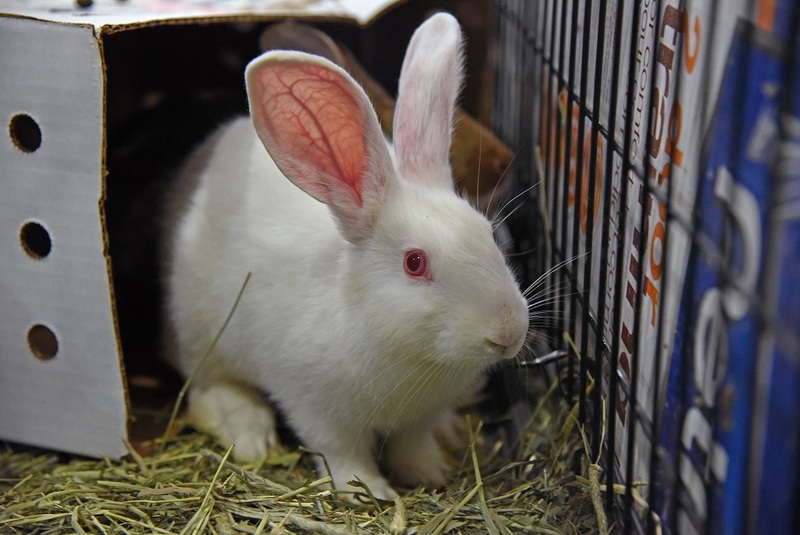 The bunnies cared for at the ASPCA included Tuff, who was subsequently transported to St. Hubert’s Animal Welfare Center in Madison, New Jersey. Rescuers would return two more times over the next 23 months to retrieve rabbits – eventually totaling 340 – including many born after the rescues took place. Their owner, Dorota Trec, was arrested in March 2015, but continued to collect rabbits. She was found guilty in November 2016 of 100 counts of animal cruelty. Three months later, on February 24, 2017, Trec was sentenced to 45 days in jail, three years’ probation, mandatory mental health counseling and a five-year, no animal order. Judge Curtis Farber also mandated that Trec pay $23,000 in restitution to the ASPCA and add her name to the city's Animal Abuse Registry. While the criminal case is now closed, the work of caring for and finding homes for the remaining bunnies – now a job for many rescues and animal welfare organizations around the city – is still not over. And the case’s impact will be felt for years to come by the many organizations who contributed resources and time. 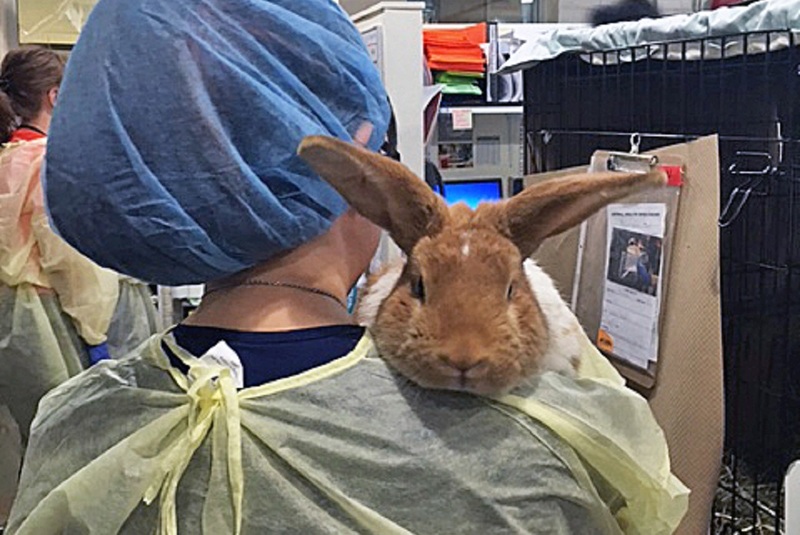 “We really stretched our limits,” said Dr. Carolyn Brown, Senior Medical Director of the ASPCA’s Community Medicine team, which performed the initial intake exams and later conducted the ASPCA’s first bunny-specific spay/neuter day, called Operation Hop, where 39 rabbits were altered. Bunnies recovering from spay/neuter surgery during “Operation Hop,” a surgery clinic just for rabbits that was arranged by the ASPCA’s Community Medicine team. 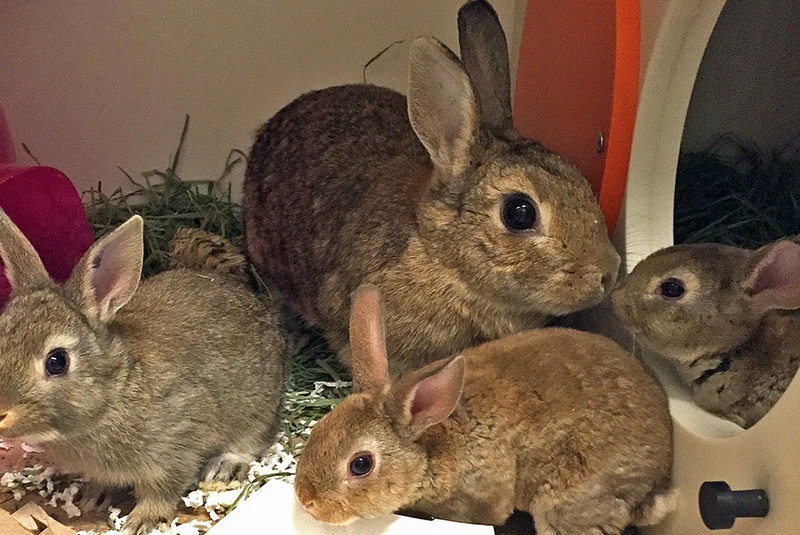 “This on-going case brought so many rabbits into our care that we actually opened a second adoption center at our Brooklyn facility,” said Katy Hansen, Director of Marketing and Communications at Animal Care Centers of NYC, which provided shelter and daily care for the rabbits at both its Manhattan and Brooklyn locations. ASPCA Forensic Veterinarian Dr. Laura Niestat, who led the veterinary forensic work, and with assistance from Forensic Administrator Ellen Vancelette compiled and summarized the medical findings for close to 200 rabbits in preparation for trial, explained that some rabbits were diagnosed with infectious diseases including coccidia and syphilis, so as a precaution, all received medical treatment. Many rabbits suffered from bite wounds, torn ears and abscesses; others had torn genitalia and damaged reproductive organs. 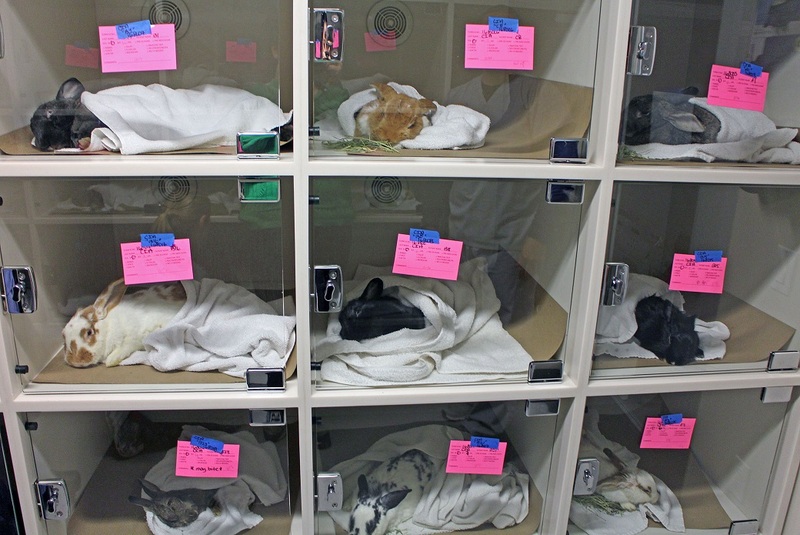 Dr. Anthony Pilny, a Manhattan veterinarian who often works with rescue groups and shelters, helped assess and evaluate the initial group of 176 rabbits. 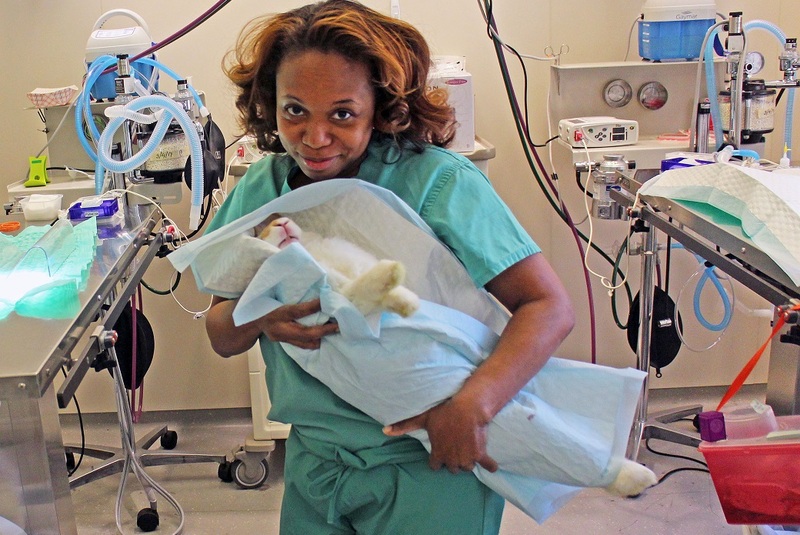 The ASPCA’s Veronica Taylor, Medical Staff Manager for Community Medicine, during Operation Hop. One of the last remaining bunnies, born in early January, is set to be transported for adoption to the Animal Welfare Society in W. Kennebunk, Maine. With such a large population of un-spayed females, it was no surprise when 12 females, called does, gave birth shortly after the initial rescue, according to Dr. Neistat. Some of the does and their kits were transferred to an improvised bunny nursery at the ASPCA Animal Recovery Center (ARC). There, licensed veterinary technicians and other designated staff tended to the does and their young around the clock, tracking and maintaining caloric intake and arranging medical exams during once-a-day cleaning sessions so the does could keep their nursing schedules. Dandelion, rescued in January 2015, with her kits at the Bunny Nursery in the ASPCA’s Animal Recovery Center. “The presence of infectious disease made it imperative that we create and closely follow strict protocols,” added Dr. Lindsay Thorson, Medical Supervisor of the ARC. As the criminal case made its way through the courts, numerous animal welfare groups stepped forward to take in rabbits once they were medically cleared. Early in 2016, the ASPCA and Ani-Care Animal Hospital of Dallastown, Pa. hosted several adoption events, during which 65 bunnies found homes. 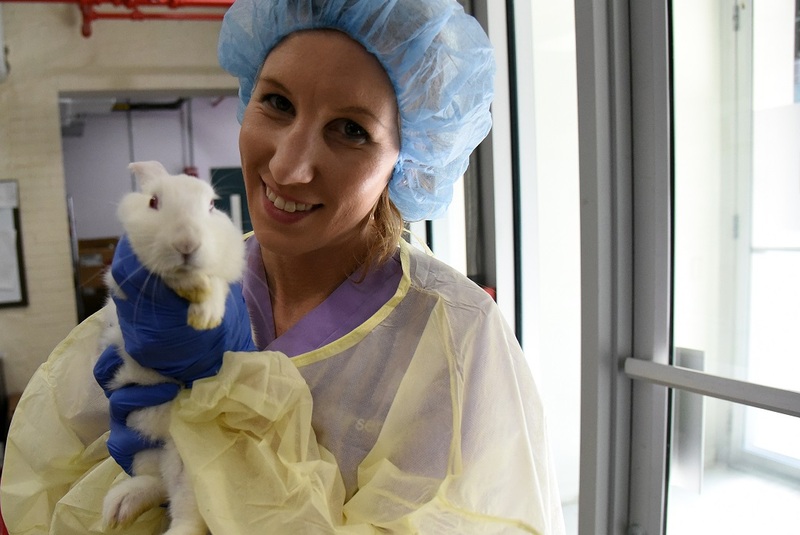 In all, Ani-Care cared for 160 bunnies and babies over a two-year period, according to Johanna Hanlon, Certified Veterinary Technician and Practice Manager/Head Technician at Ani-Care. While the effort was exhausting, “watching the improvement in the bunnies’ conditions and their personalities develop was very rewarding,” Johanna said. “Without the assistance of our rescue and placement outlets, the successful rehabilitation and placement of the rabbits would not have been possible,” said Dara Ruiz, Foster/Placement Manager of the ASPCA’s Cruelty Intervention Advocacy (CIA) team, which assisted with the removal of rabbits from the property and recruited 200 ASPCA staff and volunteers to assist with daily care. 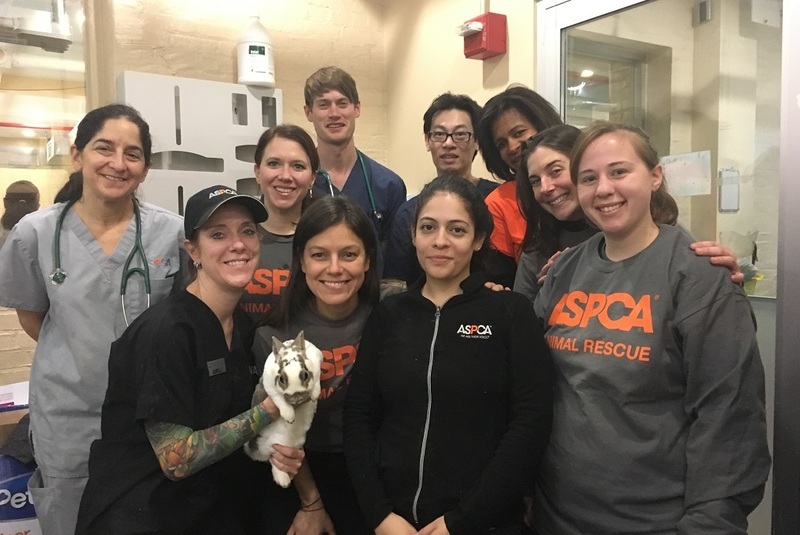 The ASPCA’s bunny intake team included, back row, left to right: Dr. Lori Bierbrier, Theresa Harris, Dr. Michael Lund, Dr. Ralph Tran, Ahsaki Benion, and Jessica Sweeney. Front row: Amie Saladis (with Caramel), Dara Ruiz, Isadora Peraza-Martinez, and Brittany Lambur. At the ASPCA’s bunny nursery, Edward Ngui, a Licensed Veterinary Technician, helped track the does’ social progress, which he enjoyed seeing unfold. “I watched them go from being extremely fearful and shy to social and not running away when we went in to clean or pet them.” For Edward, who owned a pair of rabbits growing up, it brought back childhood memories. But even for those with no prior rabbit experience, the case provided a unique opportunity to care for and learn about a species they don’t regularly handle. Andy Thai, an IT Application Analyst previously unfamiliar with rabbits, helped load and unload rabbits being transported to and from other agencies, including St. Hubert’s Animal Welfare Center in Madison, N.J, which took in 75 bunnies. Anastasia Sineavscaia provided full-time daily care for rabbits at the ASPCA, along with Kerline Dufanal (not pictured). Howard Lawrence, VP of the ASPCA’s Humane Law Enforcement department, praised the NYPD for its law enforcement work as part of the ASPCA/NYPD Partnership and the Brooklyn District Attorney’s dedication to pursuing justice in the case. Sheltering and caring for these rabbits was an enormous challenge, but thanks to a tremendous amount of dedication and teamwork from across the city and multiple states, what started in the bleak winter of 2015 is finally coming to an end in the hopeful spring of 2017. Whether the bunnies know it or not, it will be a season of second chances. The ASPCA wishes to thank the following animal welfare organizations for their contributions over the length of this case: Animal Care Centers of NYC; Ani-Care Animal Hospital, Dallastown, Pa.; Animal Welfare Association, Voorhees Township, N.J.; Animal Welfare Society, W. Kennebunk, Me. ; Berkshire Humane Society, Pittsfield, Ma. ; The Center for Avian & Exotic Medicine, New York, N.Y.; Second Chance Animal Shelter, E. Brookfield, Mass. ; and St. Hubert’s Animal Welfare Center, Madison, N.J.